Every summer I test out a new sunscreen, it's become a bit of a yearly ritual and each spring I look forward to hunting down a new product to try. As much as I know the importance of sun protection, I also know that my skin is very reactive to sunscreen products so I always approach them carefully. 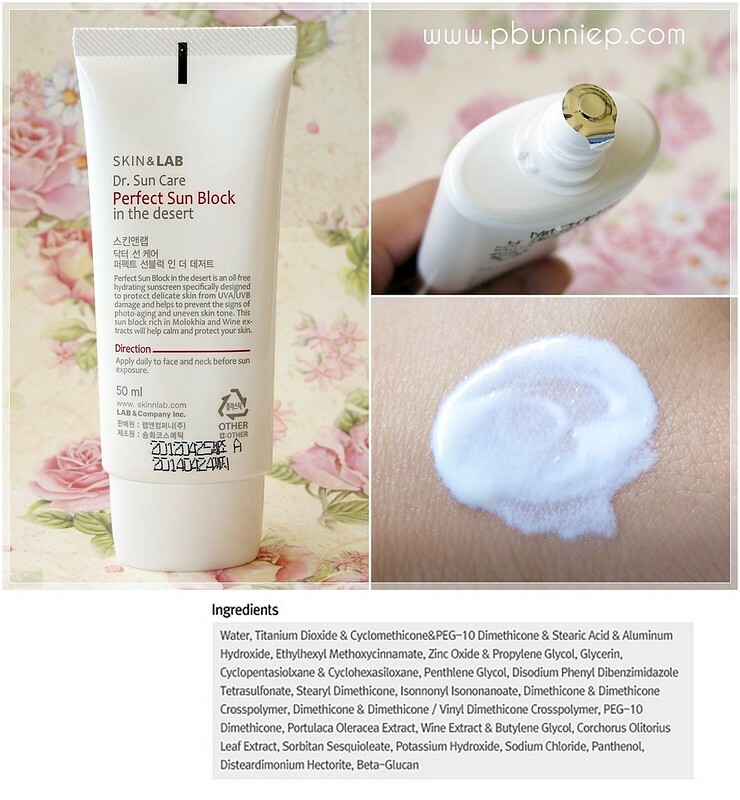 To my delight, right there in my July Wishbox was this SKIN&LAB Dr SunCare: Perfect Sunblock* and even better, it came just in time for some vacation testing down in the dry and muggy LA weather. 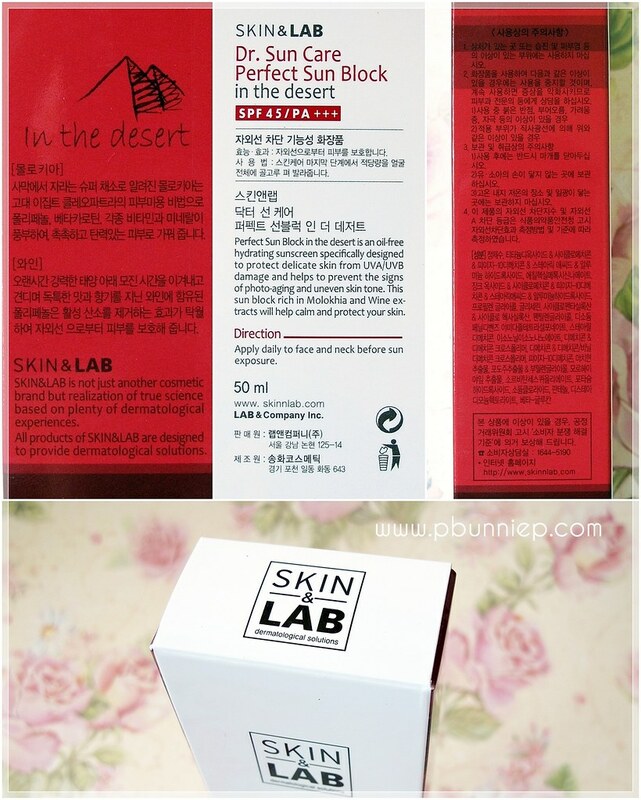 This was my first time seriously trying out a product from Skin&Lab. 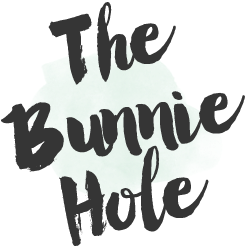 Whilst I had heard much about them in the blog community and in Korean magazines, they tend to be hard to find internationally. A few weeks prior to getting this sunscreen I had just tested some Skin&Lab skincare samples which pleasantly surprised me (more on that in another post) so I opened this tube with great anticipation. Extra details: 5-Free: No PBA, alcohol, oil, colourant or fragrance. Contains skincare extracts. 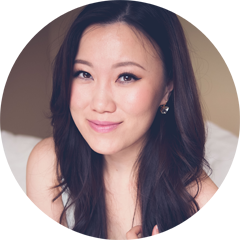 Skin&Lab is a Korean cosmeceutical brand, meaning that they combine cosmetics with pharmaceuticals and often use naturally derived ingredients to produce skin benefiting products that are meant to be healthy and effective on the skin. 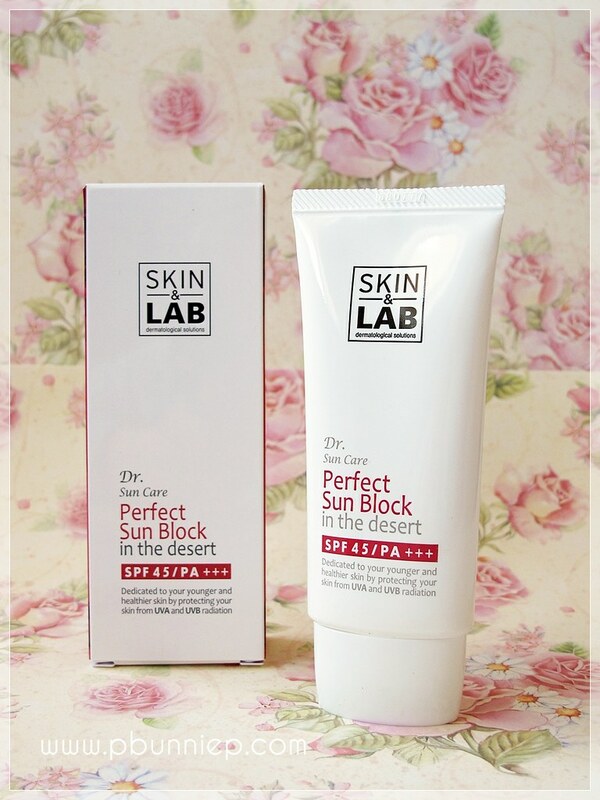 In the case of this sunblock, it contains mulukhiyya extract (a desert growing plant full of beta-carotene and vitamins), wine extract (polyphenols and antioxidants keep skin young) and portulaca oleracea extract (Korean plant known for moisturization properties). These ingredients help to minimize the harmful effects of the sun, such as skin dryness and aging. This is truly one of the main attractions of Korean products for me personally because of their focus on cosmeceutical products, I know that whatever I am putting on my skin is always doing a little something extra for me. 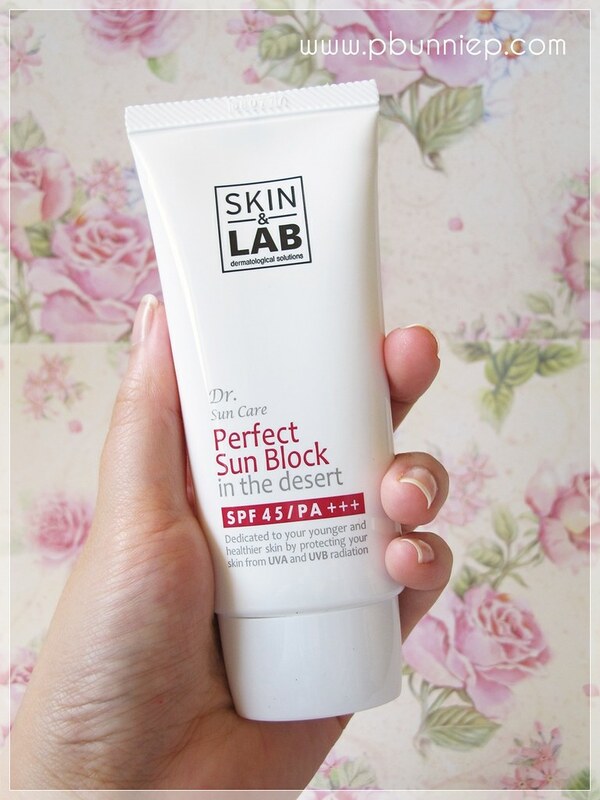 Skin&Lab's claim that this sunblock would be moisturizing yet oil-free was something that I was rather eager to put to the test. Previous sunblocks I have used were either very greasy ("moisturizing" as they called it) or terribly flaky and dry ("oil-free" as they say). Having combination skin myself, it's often impossible to find the perfect balance between the dry and oily parts of my face and I would have to sacrifice one for the other. 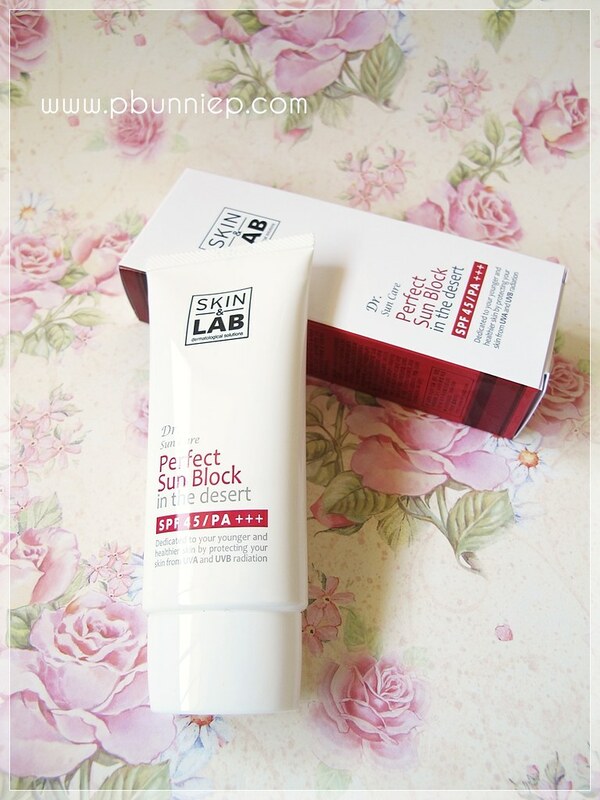 The sunblock comes out of the tube a light creamy lotion consistency and has a very moisturizing texture. However this starts off very white on the skin and it takes a good few minutes to blend this so make sure to apply it to small areas at a time and check yourself in the mirror before leaving the house. I also found that that it was at least 5 minutes before this fully absorbed into my skin. Once applied I noticed a slight brightening effect, although I wouldn't exactly call it a white cast but I wouldn't recommend this for those with very deep skin tones unless you are planning to wear foundation over it. I brought this along on my LA trip for the whole family to use and everyone agreed that it was very comfortable to wear and nobody looked ghostly in photographs. I've used this both on my face and body and it left my skin feeling soft and resilient without any residue. Even in the hot desert sun of LA, Dr. Suncare prevented my skin from drying out but at the same time didn't oil up my face either. Although the application process takes longer than I would have liked, I can say that once it gets settled in, this is a very good product for those with combination skin who are struggling to find something that will balance their face. Light consistency, moisturizing yet oil-free! Contains skincare ingredients to hydrate and protect the skin beyond just SPF. Brings translucency to the skin, no white cast on fair and medium-tan skin (haven't tested this out on dark skin tones). No breakouts, rashes or other terrible reaction. I'd recommend this to those with dry, combination or normal/slightly oily skin and especially those with very sensitive skin. Great for dry hot weather or for the cold winter weather as well. Quick tips: Take your time to work this into skin one small area at a time and give it a good 5 minutes to fully sink in. For those in hot humid weather, I'd advise wearing a powder foundation over this rather than a liquid one. And if this sunblock is picking up white flakes on the skin, remember to pop on a moisturizing cream over those areas first so it'll spread easier. 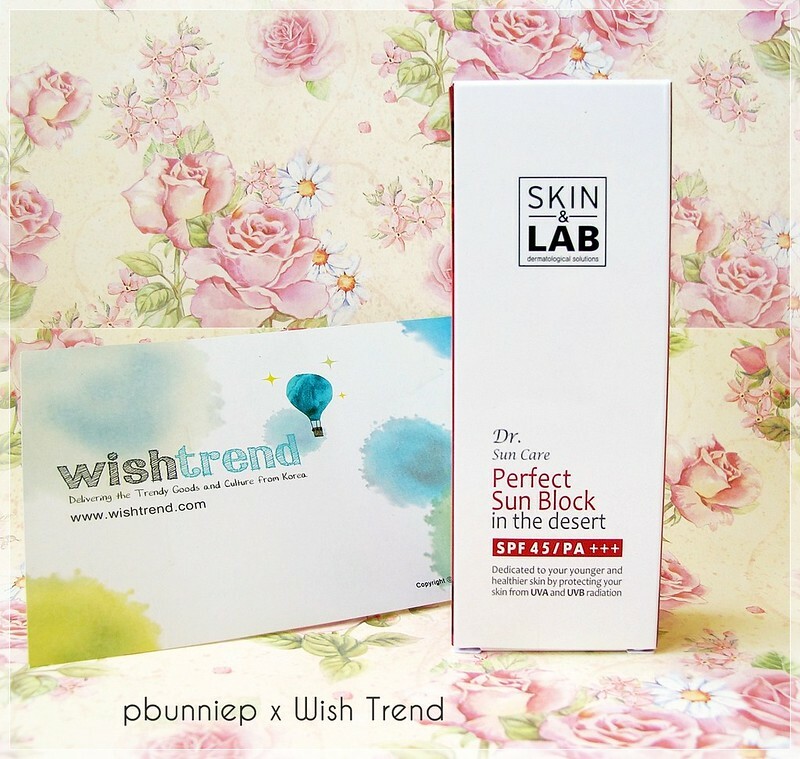 You can find Dr. Suncare Perfect Sunblock (here) on Wishtrends website, they are currently carrying quite a few Skin&Lab skincare products as well. During their special summer promotion, you can find this for a limited time for only $13.60USD (regular price $16.99). For who've always had a hard time looking for a good sunblock, I think it is certainly worth a shot. Wearing this continuous for an entire week all day every day, I haven't noticed any breakouts or skin reactions what so ever. This certainly proves itself to be an effective but gentle product and I think that is quite a feat in the sunscreen world for me. In fact, I think that's one of the things that people have mentioned most about this sunblock. Enjoy the rest of the summer sunshine and have a happy skin day! This looks promising :) I have been dying to try out Wishtrend!